Are We Wounded by Christ’s Love? The days are already noticeably longer since the darkest day of the past year, the solstice right before Christmas. In the more than 40 days since that time, we have listened to many references to the light of Christ’s appearing. It was the constant theme during Theophany and home blessings. Now, at the Feast of the Presentation celebrated last Tuesday, the Light image culminates with Simeon’s prophecy: Christ is a Light to enlighten the Gentiles and the glory of God’s people, Israel. Our Lord’s unique role in our salvation is revealed, he is the hope and salvation of the entire world. But at the same time, the Prophetess Anna also speaks of Christ’s mother. Her role, too, is unique. She will bear the pain of that revelation all the way to the cross for “a sword shall pierce her heart.” She will be in fact wounded by her love of Christ and serve as the model of all the faithful who would follow her son. Let’s ask ourselves: Are we wounded by his love as well? An angel revealed God’s will that she be his mother. Magi brought gifts. Herod sought to slay her newborn child. Mary took all these things and treasured them in her heart, willing to be with her Son until the end, despite the uncertainty and the pain that her love for him brought her. Mary stays with Christ until the End precisely because of her hope, her faith that Christ is not only her Son but her God and her Savior. Truly, love for Christ will bring pain and uncertainty to our lives as well. Yes, He is the Light of the world, but much of the world still prefers darkness to Light. Knowing that He is the Light, however, is our constant reminder that no matter how dark our days, our love of him lightens our path. This is why Mary could walk all the way to the Cross, not truly comprehending her Son but wounded by her love for him. 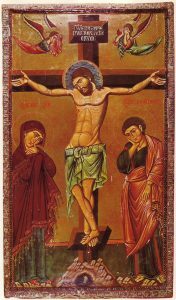 Soon, it is our time to walk to the Cross once again: Lent and Holy Week and Pascha. Christ enlightening our way there and Mary showing us how we are to get there. We won’t be able to comprehend it all. We can arrive there nevertheless, if we are wounded by our love for him as we go. P.S. : Speaking of being wounded by love, our parish has been walking in grief this past month with the Swisher family at the tragic loss of their youngest son, Jordon on January 4. Continue to keep them in your prayers and to keep walking with them. A 40-day memorial for Jordon is scheduled for Sunday, February 14.